The sorting and filtering of files is controlled via the Sort & Filter panel, which, by default, is located in the right-hand column of panels. The panel displays filtration parameters, which extend the filtration over ratings/labels that we had in previous versions. 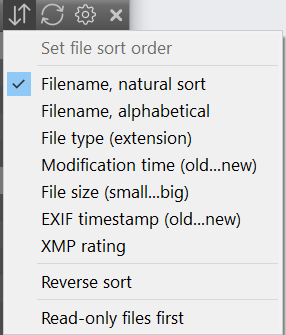 The sorting of files can be set in the menu that appears when pressing the sorting icon (second from the left in the panel header). By filename, natural (meaning that numeric components will be sorted by value). 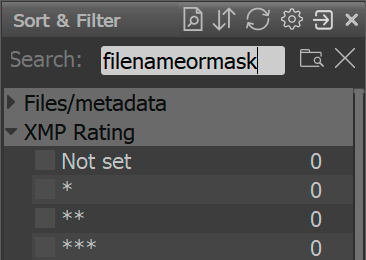 In cases when two files have the same value for the category by which they are being sorted, the natural filename is used as an additional “sorting key” (when sorting by filename, the file extension is the second key). 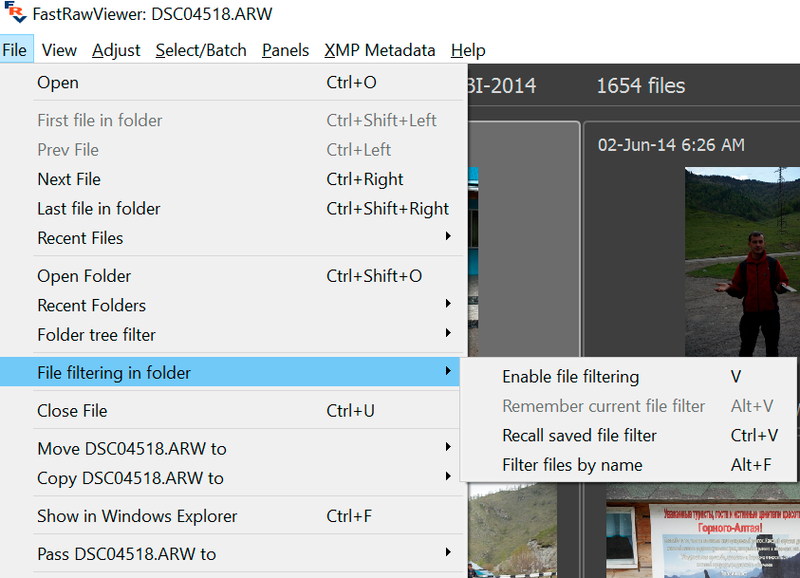 To sort by metadata, which needs to be read from the file (EXIF, XMP), the sorting occurs dynamically and is animated, synchronously with the reading of the current folder. Filtration is controlled by the rest of the new Sort & Filter panel. The panel displays the types of parameters (XMP Rating, XMP Label, EXIF Timestamp) and value options. You can check the checkbox to the left of the sorting and filtering parameter, and only files that pass the filtering conditions will be displayed. If there are any selected files in the folder (see the next section), you can check the checkbox to the left of the word Selected in the Files/Metadata group, and only the selected files will be displayed. In this case, if you unselect some file, it will be excluded from the display, which means that in order to have it displayed again, you need to uncheck Selected and select the file again, after which you can check Selected once more. The filtration inside one group is of OR-type. The filtration among groups is AND-type. 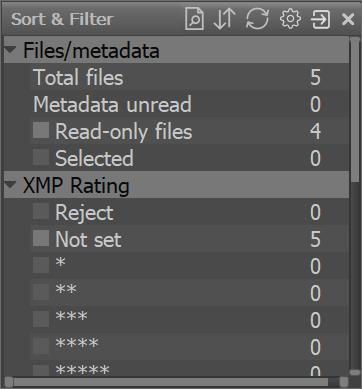 That is, if, for example, you select XMP Label Yellow and XMP Label Green, files that have either of those two labels will be displayed. 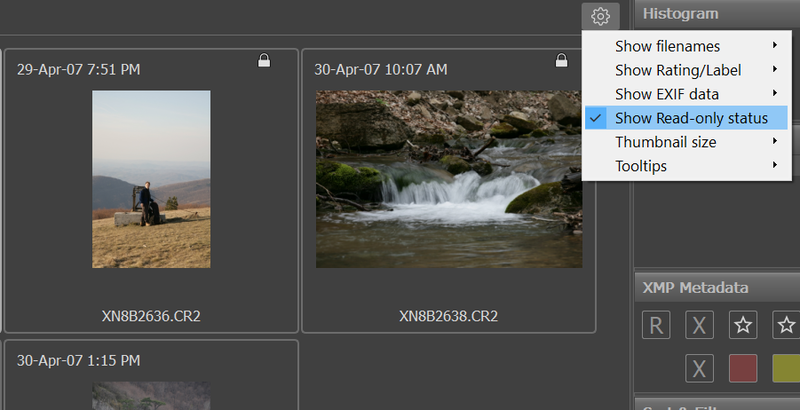 If, however, you checked XMP Rating: 3, XMP Label: Green, and EXIF Timestamp: This week, only the files which conform to all three conditions simultaneously will be displayed. Disable/Enable file filtering (assigned to V by default) flips the status of filtration. If it’s on, it’s switched off; the filtering conditions are temporarily stored so that when the filtering is re-enabled, the previous filtering conditions are automatically applied. Additional sorting and filtering settings are described in the “Program Settings” section below. I. In Grid View mode, Locked files are displayed with a “padlock” symbol. Displaying the “padlock” is turned on or off through the Show Read-only status (Locked/Read-only on Mac) in the Grid/Filmstrip settings, by default turned on for Grid, off for Filmstrip. II. If there are one or more Read-only/locked file in the folder, then the line Read-only files (Locked/Read-only on Mac) appears in the Files/Metadata section of the file filtration panel. If it’s checked with a checkmark, then only Read-only/Locked files will be displayed. III. 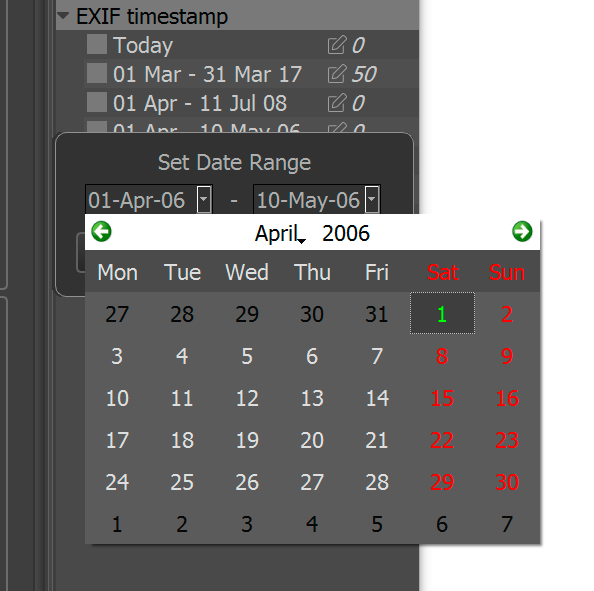 In the sorting preferences (see above), one can set the Read-only files first (Locked/Read-only on Mac) setting, and then such files will be displayed at the beginning of the list in Filmstrip/Grid (the order within the RO/Locked group, and others, is set by the other sorting settings). IV. When copying/moving files using FastRawViewer, the attributes are kept. V. On Mac, with default settings, the moving of locked files is forbidden. The Copy/Move/Reject - Allow move/reject for locked files setting allows for the moving of such files and placing them in _Rejected.